The volatility in the markets stays in multi-month lows, a feature that in the latest months has been affecting our running strategy ARION. ARION needs good volatile days to enjoy impactful trades. Impactful trades can have either a positive or negative outcome and ARION relies then on the statistical edge to pocket gains over a large number of impactful trades trades. 1- The VIX has been hovering in the region of 10 to 12 what is commonly known as a super-low VIX. In the last year there hasn’t been such other long period of super-low VIX. Sure enough overall YTD (Year To Date) ARION has a positive performance of shy above 2%, but that hardly brings us any big satisfaction as these figures don’t add up to our long term return objective, of at least a positive 2% average monthly return. 3- In the past year, the two moments when VIX reached it’s highest values on record, coincided with the moments when ARION too recorded it’s best months in the same one year period, both pip wise and in real money return. We must also point out that Odysseia Capital decided to stop trading prior to the BREXIT referendum, therefore in June ARION only traded approximately half of the month. This explains why the month of June 2016 was the “only” the 2nd best when in fact this was the month when the highest VIX figure was recorded. 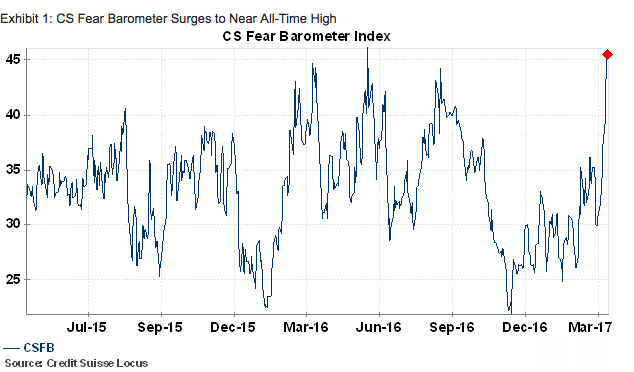 4- It seems that the markets might be entering a new higher VIX period. This should bring no surprise in itself, as the geopolitical situation has been degrading on a daily pace, be it the hardships the USA president Donald J Trump has been experiencing in approving core pieces of his intended policies, be it the resulting change of the US focus from internal politics to the external international stage, with increased rhetoric in warfare issues. Source: Credit Suisse, Business Insider. If geopolitical tensions don’t ease up (and they seem to be deepening, be it North Korea, US-Russia relations or Syrian and Afghanistan conflicts) , it seems the markets are in an optimal position for an higher VIX leg, which it could be a good setup for ARION. To whomever might be hanging on the fence to subscribe our ARION service, this might be the a good moment to do it and take advantage of a possible next upper leg in the VIX and ARION trade results. The service can be either subscribed here or at the market place simpletrader.net. Please don’t hesitate to contact us with all your questions before placing your order. Odysseia Capital is about to making changes to the portfolio, aiming to be better positioned to this eventual market development. These will be announced soon.